This could have cost somebody his transportation. But it didn’t, proof that not all mishaps turn out to be calamities. I came across this scene on Albany’s Elm Street Saturday after taking a look at the aftermath of an actual calamity across town, the fire that destroyed the Burger King at Geary and 14th. 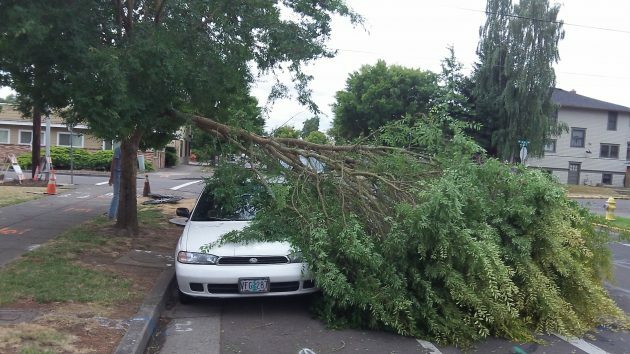 On Elm, it looked at first as though this big and heavy limb of a street tree must have crushed at least part of the parked car. But after a neighbor fetched his chainsaw and cut off much of the weight, police Sgt. 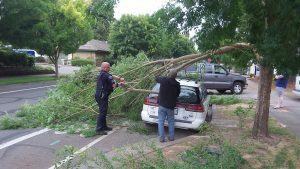 Steve Dorn joined the neighbor and a bystander in lifting what was left, and the owner was able to drive the car out before the rest of the branch was cut off and fell down. No damage, as far as we could see, except to the tree. Police Sgt. Steve Dorn helps clear away sawn-off branches. Quite a contrast to what had happened across town, where scores of people maneuvered through traffic still snarled by street closures in order to get a peek at what used to be a popular fast food restaurant which, according to lots of people, had just undergone a big remodeling job. 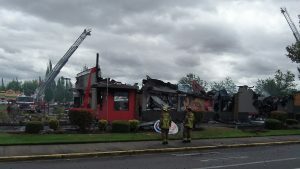 The severity of the loss was obvious, and the only good news there was that the staff and the breakfast-time customers got out without serious injury as the place went up in flames. 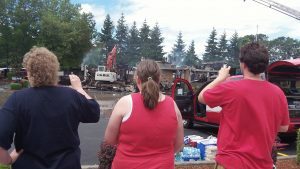 Onlookers record the scene after the Burger King fire. Almost nothing was left of the restaurant. By the time I passed by there on my way back from some errands, 14th and Geary were still blocked. But people had found a way to gather around the perimeter and aim their smart phones to record the scene. An excavator was shoving the smoking debris around, and the standing lake of firefighting water was being pumped into nearby storm drains.